Devart company continues to improve their connectivity solutions including ODBC driver for Firebird. Devart company updated its set of ODBC drivers for various databases including Firebird database. Check what our new ODBC‬ drivers can offer to you. Devart team is proud to introduce new Firebird ODBC Drivers. – Drivers fully support standard ODBC API functions and data types, multiple server data types and features. – Advanced connection string parameters provided to allow any desktop and web applications to access databases from various environments and platforms, that support ODBC. – Full Unicode support provides capacity to interpret Unicode function calls without the intervention of the Driver Manager. – Advanced data conversion from DBMS data types to native ODBC data types. – Support for 32-bit and 64-bit Windows platforms provides capabilities to develop both 32-bit and 64-bit cross-platform database applications (Linux and Mac OS X platforms will be supported in the next version). ODBC driver for Firebird supports Firebird server and client versions 2.x, 1.x. I was recently contacted by a Firebird user on MacOSX who was trying to get the Firebird ODBC driver to build on MacOSX. I thought I would try and step in to help. For those of you who follow the CVS checkins for OdbcJdbc you might have noticed the addition of a number of a new directory in the Builds directory called Gcc.darwin containing a makefile, a readme and a .sh file to create a lipo’ed dylib. The driver sucessfully builds and passes some simple tests. Feel free to contact me for a copy of the dylib to test further. All changes you can look in the file – changes-v20.log. #ODBC Driver Project Lives Again with new Version 2.0 Release Candidate 2. The Open Source Firebird (IBPhoenix) ODBC driver has been updated to Version 2.0 Release Candidate 2.
driver 2.0 (with full x64 support and fixed “blocker” level problems) now. ps: if you don’t know what is the bag tracker 🙂 it’s Firebird Project’s bug tracker. I can’t retrieve any values from the database. IBProvider for Firebird and Interbase has been released. Loading of charset information for COLUMN and PROCEDURE_PARAMETERS metadata schemes from system tables. We added ctype_user property that allows setting the encoding of data coming to client irrespective of the encoding in which this data is coming from database server. New algorithms of BLOB fields converting provide for quick work with flowing data, optimization of interaction with ICU library. We added ctype_none property that allows setting the charset for working with text data in NONE encoding. Support of Firebird and Interbase charsets aliases. See detailed information on working with new character set processor in Firebird and Interbase character sets. IBProvider started to control text columns size when working with Firebird 2 servers in Unicode mode. If the length of loaded data exceeds the text column size the exclusion will be generated. Disabled metadata cache mode performance was increased in 2.5 times. Metadata schemes were updated. Among them in schemes TABLE_INFO and TABLES classification of external (EXTERNAL TABLE) and temporary tables (GLOBAL TEMPORARY PRESERVE/DELETE) was added starting from Firebird 2.1 and Interbase 7.5. Correct processing of active transactions in the connection pool. BLOB-columns metadata description bug was fixed. Details on the Firebird driver site. New to Firebird? Read this! 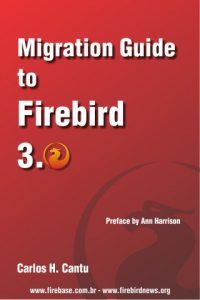 What languages do you use with Firebird?